Grand Prix winner Alice Clero. 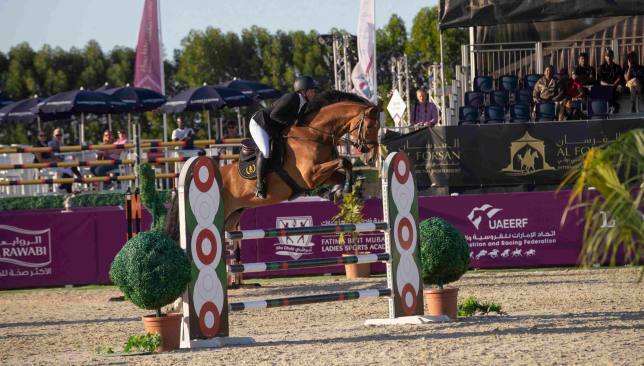 The sixth edition of the FBMA International Show Jumping Cup drew to close on Saturday at Al Forsan International Sports Resort in Abu Dhabi. 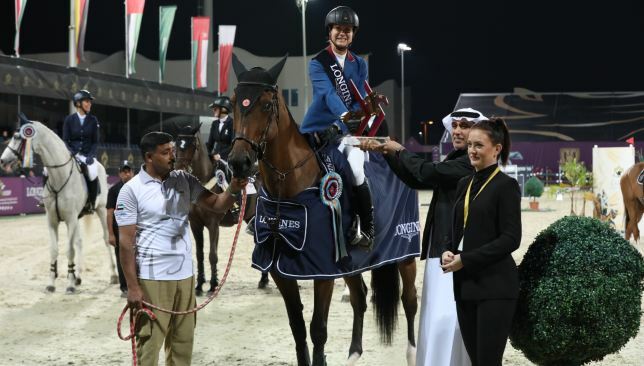 HE Sheikh Nahyan bin Mubarak Al Nahyan, Minister of Tolerance, was in attendance and awarded the winning riders from the CISL2 category, as Leila Malki took gold, Danish rider Tina Lund took silver and Maria Gonzalez Iaguillo won bronze. The final Grand Prix race was clinched by American Alice Debany Clero, while Anita Annika Sande claimed the silver medal and Brit Georgia Tame took bronze. Sheikh Nahyan said: “without the constant support of HH Sheikha Fatima Bint Mubarak and the continuous follow-up by Her Highness Sheikha Fatima bint Hazza bin Zayed Al Nahyan, Chairperson of the Fatima Bint Mubarak Sports Academy and President of Abu Dhabi Club and Al Ain Women’s Club, this event would not be possible. Sheikha Fatima said the event could not have achieved such success if not for the utmost support of Her Highness Sheikha Fatima Bint Mubarak, President of the General Women’s Union, Chief Executive Officer of the Family Development Foundation and President of the Higher Council for Motherhood and Childhood – Mother of the Nation. 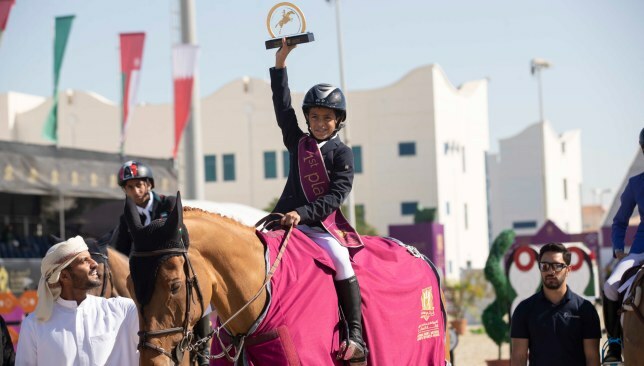 She expressed her pride for the outstanding participation of Emirati riders in this year’s edition, saying: “The FBMA International Show Jumping Cup 2019 has witnessed an increase in participation, in addition to a spectacular performance by Emirati riders, which is a culmination of our longstanding efforts to foster Abu Dhabi’s position as an international destination for major sports events, as well as encourage women to flourish in sports and achieve their potential. “The event has surpassed all expectations once again, and we truly admire the continuous efforts and persistence of all participating riders from the UAE; they contribute to promoting Abu Dhabi as a leading sports destination across the world. “The Academy would like to thank all of the riders, from the UAE and around the world, who gave competed with passion and fairness. We are also grateful to the sponsors who have helped make the sixth edition of this special event a great success. 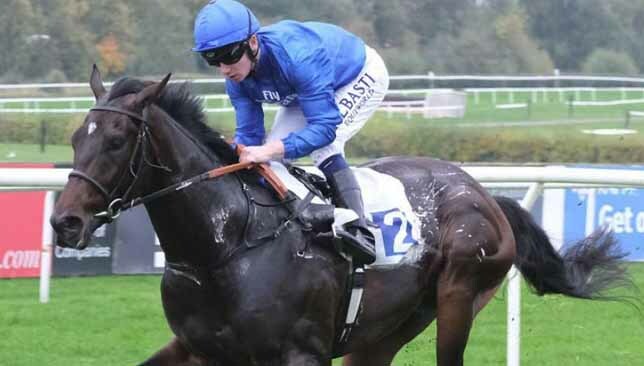 Clero, who went away as the final winner of the Grand Prix, chalked up two great times in the shape of 80.25 and 38.83. Norwegian Sande recorded times of 81.27 and 39.09, while Tame timed in at 80.08 and 39.42.